Welcome to Nomad Events! We are a team of event producers with a passion for designing experiences. Our core business is organizing corporate & large-scale public events. 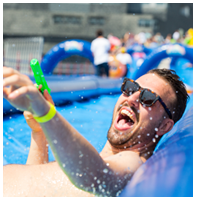 The Hyundai Fan Village is a large-scale event on one of Belgium’s biggest squares, where thousands of supporters came to cheer the national soccer team at EURO 2016 in France & the Fifa World Cup 2014 in Brasil. All matches were aired on a huge LED screen. Famous Belgian DJ’s rocked the crowd and some spectacular fireworks and special effects provided a genuine festival atmosphere. We have created some amazing experiences together with our clients. Thanks for your trust! Nomad is a team of event producers with a passion for designing experiences. Creatively fueled. Our core business is organizing corporate & large-scale public events. Whether it’s an inspirational teambuilding for 25 employees, an exclusive product launch for 300 clients or a large-scale happening for 20.000 guests. To us, it always means: creating memorable moments that bring messages to life. We are more than happy to demonstrate our talent and 11 years of experience by making a creative proposal for your next event. 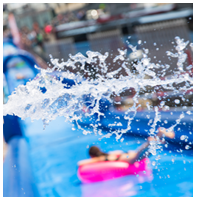 The Big Slide = hundreds of meters summer fun in the heart of a city with a very, very long waterside and lots of summer animations!